Online book reviewers are fantastic because they take the time to write something that will be helpful to others. I love the ‘Amazon Vine’ scheme, where the Vine reviewers are objective peer reviewers. I can rest assure that it is not the author’s auntie who is giving a book five stars, but somebody unbiased. This I like. I have been absolutely blown away by the reviews which have come in since the publication of The Abominators this February which include three from Amazon Vine reviewers. Thank you SO MUCH to those who have taken the trouble. Here are the selection of reviews which are currently on Amazon. My 7 year old twin girls adore this book. They’ve read it 6 times and find it hilarious. They love the character Cecil and his extremely funny ways. One of those gems of a book that gets real belly laughs. This is a thoroughly entertaining book, eminently readable by its target age range and great fun. It’s `rude’ enough to offer a guilty appeal without going too far. I thought my grandson was going to wet himself, laughing hysterically at times! The book has many interesting characters and is nicely illustrated. It should appeal to just about all 7-11-year-old boys and many girls as well. Looking forward very much to the next one. I got this for my 9 year old boy, he has read lots of similar books such asGenius Ideas (Mostly) (Tom Gates) and also the Diary of a Wimpy Kid (Book 1), but he doesn’t like the books that have that comic look text to them where the text is at all sorts of angles and there are speech bubbles with daft scribbled drawings, wimpy kid has loads. The Abominators has proper text and layout, much better, the drawing are fun and don’t take away from the reading. My little lad loved the book, thought it was funny and had a smile on his face as he was reading. Hilarious read, reminded me in some ways of me reading some early Tom sharpe books that made me laugh out loud. I would highly recommend any books by this author! She has a wicked sense of humour that will make you laugh out loud! Looking forward to the next books! I read this book to my boys, aged 11 and 9 over the course of two evenings (we couldn’t put it down!). It is a hilarious family read with a wicked sense of humour that appeals on many levels. Both boys have re-read it, the oldest simply because it was so entertaining and the youngest, who struggles with reading, was motivated to get from one funny antic to the next! Very much looking forward to the next instalment. Brilliant!- both my boys loved reading this book and when I took a look it even had me laughing out loud. Perfect for kids aged 7 – 10 who like cheeky humour. As a headteacher of a primary school, I’ve just read this book to see whether it would inspire and encourage boys of 7+ to read. It will! We will be puttifng some copies in school and look forward to the publication of the next two in the series. 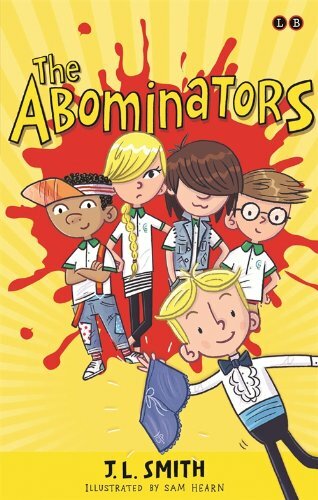 The Abominators are a gang of four primary school kids who enjoy causing mischief, whether flicking bogies across the classroom, pouring vegetable oil over the floor to make the teachers slip over or filling the school toilets with strawberry jelly. They aren’t interested in making new friends, especially the previously privileged but now poor, Cecil Trumpington-Potts and his `babyish’ way of talking. Sadly (for them) Cecil has other ideas and is prepared to do whatever it takes to join the gang and so his initiation begins! I liked this book, the illustrations are great and it has a good vocabulary. As I’m the parent of an `exuberant’ child, I am slightly concerned that this book might give him ideas but I can also see that it’s just the kind of book and just the level of naughtiness and humour that kids find hysterical! Perhaps this is a good book for reluctant readers, especially as it is the start of a new series. Good fun. Here is the link to the above reviews on Amazon. Thanks again, all!